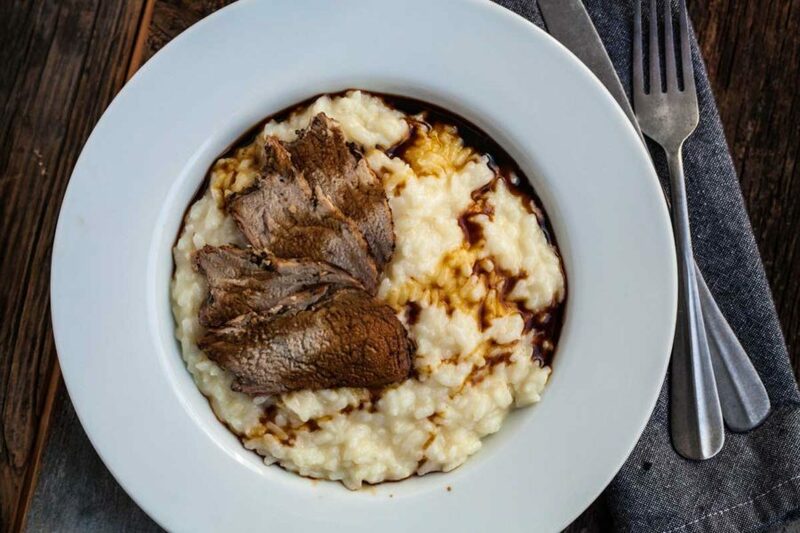 Food 4 Thought - Issue 1 - Black Garlic Molasses | Blog | Di Bruno Bros.
Have you ever tasted an ingredient so inspiring and delicious that it made you mad? Like, “I’m 36-years-old and I’m just tasting this for the first time now!? I’ve wasted half my life!” That is exactly what ran through my mind when I tasted Black Garlic Molasses at the Fancy Food Show this summer. Pressing for more info, my frustrations were quelled when it was explained to me that nobody has tasted this before. It’s brand new to the market, and its very existence is somewhat of a fluke. Dave Vohaska is the man responsible not only for bringing this product to the United States, but for identifying its viability in the specialty food world. 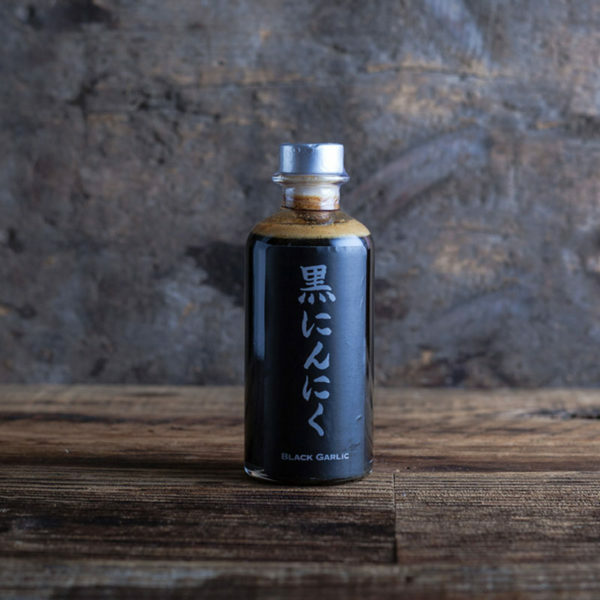 An importer of premium Japanese condiments, Dave was in Aomori, Japan visiting a black garlic producer when he noticed a thick, dark-black syrup on the production line in another room. Thinking it was fig molasses, he asked if he would be able to sample it. He was told that it was, in fact, a molasses derived of black garlic, and that it wasn’t finished yet. The molasses was on its way to an oxygen vacuum tank, which would reduce it to the texture of shoe polish, before it would be dehydrated into a powder. That powder would then be packed into pill form and distributed to state-run elderly homes to combat Alzheimer’s and dementia. YOU’RE NOT GOING TO LET THAT SUBLIME GARLIC NECTAR GO TO WASTE, ARE YOU? Fortunately, Dave insisted on trying it, and immediately recognized great potential in this product as-is. No need to pulverize it to reap the benefits, and molasses tastes way better than a pill anyway. He convinced them to bottle it and ship it to America. Having grown up in the Italian Market, I am unfamiliar with the concept of not liking garlic. (Our rule for calculating the amount of garlic needed is to take the advised amount, double it, then add one, just to be safe). But if you are turned off by its pungency, black garlic might be worth trying. Black garlic is, essentially, naturally-fermented garlic, achieved by gently heating fresh bulbs in a controlled environment for 1-2 months. During fermentation, the pungency dissipates, but the sweet, fruity, savory flavors remain. If you slow-roast that black garlic so that the sugars caramelize and concentrate into a syrup, that’s black garlic molasses. Envision extra-aged, super-viscous balsamic vinegar. Now imagine it with less acidity and add an underlying current of garlic-umami goodness. That’s what you have here. Layer sliced tomatoes, mozzarella and basil, then crank it up to 11 with a drizzle of this. Your choice of veggies, maybe some diced or shredded chicken, pork or fish, flash dried in olive oil and finished with black garlic molasses. Use a pastry brush to gently gloss over pork loin, porterhouse, or roasted chicken. Prepared traditionally with onions and chicken broth, but rendered “Wow” by mixing in this at the end. It’s quite striking visually, too. Extra creamy style, almost cloud-like, with this swirled in just before serving. 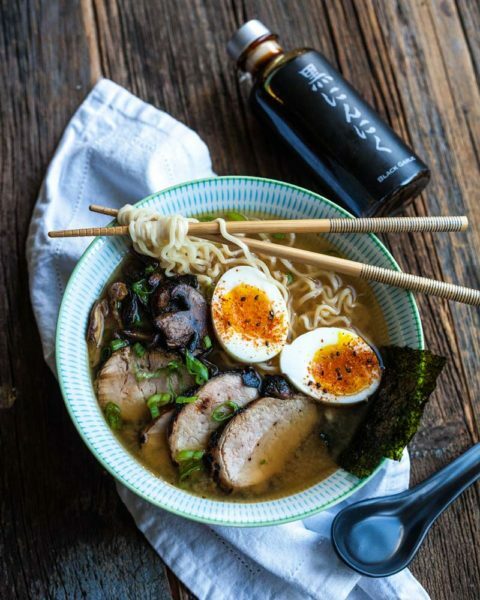 Elevate your instant ramen with this perfect-for-fall recipe! 1. Marinate a pork tenderloin in equal parts Black Garlic Molasses and soy sauce for at least 1 hour. 2. Prepare your favorite instant ramen noodles and broth. 3. Sear tenderloin on 4 sides about 2 minutes per side. 4. Allow pork to rest. 5. In the same pan, add sliced mushrooms and a drizzle of oil (preferably sesame). Saute until they reach a deep brown color. 6. Finish mushrooms with a drizzle of the black garlic molasses. 7. Top the ramen with sliced pork, and mushrooms. Cooking Time: 4 hours. Active time: one hour. At least one hour ahead of time (or just before, if you forget, or don’t have time), salt and pepper all sides of the pork loin. In a crock pot large enough to fit the entire loin, sear all sides of the loin. About three minutes per side. Add one package of chicken stock/broth to the pot. It should come about half way up the loin. Add a few sprigs of rosemary and thyme, cover the pot, and put in the oven. Cook until internal temperature has reached 145 degrees. About 3-4 hours, depending on your oven. About 45 minutes prior to dinner, add olive oil to a high-walled pan over medium-high heat. Add the second package of chicken stock to a separate pan over medium-low heat. Dice the onion and simmer in the olive oil until it becomes aromatic, 2-3 minutes. They should be tender, and just starting to brown. Mince the garlic and add to the onions. Turn the heat down to medium to ensure you don’t burn either. After the garlic becomes aromatic, add all the rice and evenly mix into the onions with a wooden spoon or spatula. Open the oven, and take about two cups of the stock from the pork loin and add it to the risotto rice. Continue to cook the rice, stirring constantly, until all of the stock is absorbed. Then add a half cup of the stock warming on the stove. Continue to add stock a half cup at a time until it is all absorbed. Stir constantly. About half an hour. Note that at no point should the stock be boiling. The rice needs to slowly absorb the stock in order for the texture to come out right. Taste to confirm the texture is creamy and the rice is ready to serve. Add a swirl of black garlic molasses to the pan, making concentric circles. Then stir into the rice. Remove from the heat. Remove the pork loin from the oven and slice into portions. Plate next to the risotto and drizzle both with a bit more black garlic molasses. For an added boost of flavor, drizzle yuzu oil over the risotto. The interplay of garlic and citrusy yuzu is truly delightful. If desired, pour the stock from the pork loin into a gravy boat and serve at the table. Hunter Fike taught me a lot of what I know about cheese when he waited on me at the 9th St. store. I loved everything that he suggested and I still buy Montgomery Cheddar, Cravero, and Carles Roquefort. I’m buying black garlic molasses because I trust Hunter so much. I’m glad that he can still steer me towards the best products through this blog, since he doesn’t wait on me any more. Ihhhhh I love garlic! Can’t wait to try this! i continually find the information on your website to be educational and interesting. i see the world with my eyes of Italian family heritage, heart and soul, as i think your family does…..please tell us more and more. living and working in Italy for a time, gave me another rung on my ladder to reach higher into knowing how to assemble the many elements of what it means to eat “Good” a friend asked me if i would take her Mother to the market instead of her, i said “yes”……..we ended up at the De Bruno family store in south Philly……..shopping changed for me and my little world did as well. I bought a bottle, maybe two months ago. It has turned gritty. Is this just crystallization or has it gone bad? It hasn’t gone bad. It just crystallized. Try submerging it in hot water for around ten minutes and it should return to normal.